I’ve been going to Winco in Folsom almost every weekend, as it’s such a nice store compared to anything near downtown, it’s near a light rail station, and food costs much less there than in town. Last weekend I spotted this special bird, but I didn’t remember to look it up and find out what it was until this weekend reminded me. It was swimming in a creek that I cross over when I walk to Winco. 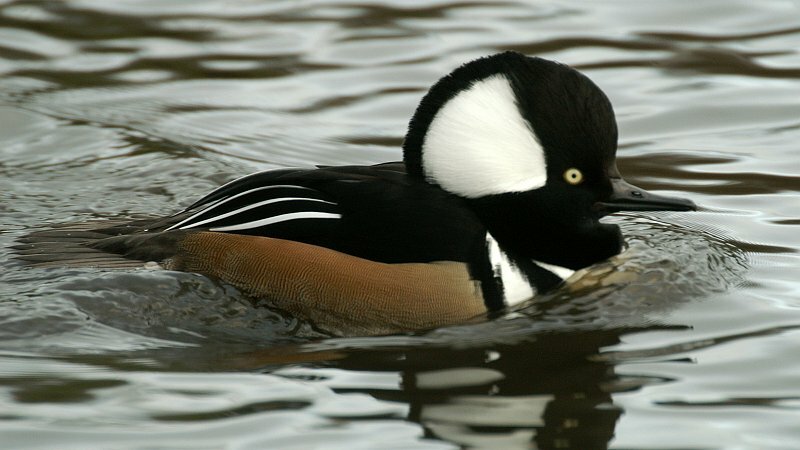 Known as the Hooded Merganser, this duck winters in no-freeze zones, then returns north during the summer. It is absolutely unmistakable when you see it; the appearance of the male’s head is so striking. This photo was borrowed from Wikimedia Commons, and kindly provided to them by scientist/photographer Ken Billington. This entry was posted on 3 March 2019 at 8:57 pm and is filed under Travel. You can follow any responses to this entry through the RSS 2.0 feed. You can leave a response, or trackback from your own site.